Not long to go now until tonight’s action packed evening of boxing action gets underway! We have heavyweight action with Tyson Fury Vs. Steve Cunningham, we have an important light-heavyweight encounter between Nathan Cleverly and his mandatory, Robin Krasniqi, and we have a massive, tough-to-call light-middleweight unification bout between future megastar “Canelo” Alvarez and Austin Trout. The action takes place in New York, London and San Antonio, Texas. All three cards have some interesting supporting bouts, but it’s the big three that are most exciting for fans. Tyson Fury deserves credit for the quality foe he and his team have accepted for his U.S debut, in Former IBF cruiserweight champ Steve “U.S.S” Cunningham. Cunningham may be 36-years-old and he may be giving away plenty of height, weight and reach, but, with his proven heart, the power he showed down a division and his experience, Cunningham might have the tools needed to either upset Fury or make him look quite ordinary. Fury would no doubt love a smashing KO victory. I don’t think he’ll get one. Look instead for Fury to learn plenty as he scrapes through the 12-rounder that will contest the IBF #2 spot, by close decision. Possibly one that leaves Cunningham feeling as aggrieved as he did when he was “robbed” against Tomasz Adamek. 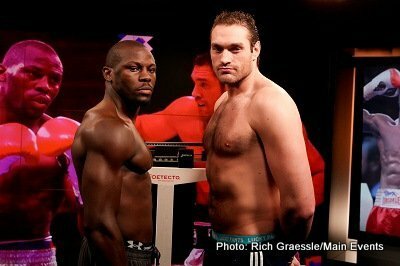 Prediction: Fury by close, debatable decision. Saul Alvarez is also taking a risk against Austin “No Doubt” Trout. In fact, the red-haired Mexican is taking a far bigger risk than is Fury. Trout is no big puncher, but he has great skills, is clever and fast and he is oh, so confident. I think we can look for another close decision here, too. Canelo is younger and he hits harder, but can he land enough punches on the tricky Trout? Someone’s “O” must go, and tonight I think it’ll be Trout’s – but by a razor thin, even ugly, decision. Another bad verdict in Texas? We’ll soon see. Prediction: Alvarez by a thisclose points win. Nathan Cleverly has been waiting for the longest time to get a fight and see it actually take place, and though ring-rust could be an issue in the early going, I think the classy, supremely fit and dedicated Welshman will ultimately take out his frustrations on Krasniqi. Bigger fights await “Clev,” and he will not ruin his chances by losing tonight. Prediction: Cleverly by mid-rounds stoppage. I pick round seven!